Tom Morris was born 1821 in St. Andrew, he became 86 years old. He started playing against other kids with corks from wine bottles as ball and a homemade club. At the age of 14 he was hired as an apprentice by Allan Robertson (regarded the first professional golfer in the world) at St Andrews Links, before this he had already worked as caddy and played some golf. He stayed with Robertson for almost ten years. Robertson and Tom played as a team for many years and the rumor said that they never lost a game and got the nickname “The Invincible”. Tom Morris was fired from his job with Robertson in 1851 when he was caught playing with a gutta-percha ball (guttie) which just had been invented a few years earlier. Robertson had a profitable business making feather balls. Tom Morris was hired by Prestwick Golf Club where he designed, laid out, and maintained the course. He also had a shop for golf equipment and gave lessons to players. He was important in the beginning of the Open Championship in 1860 which was played on Prestwich and Tom hit the very first shot in that event. He returned to St. Andrews in 1865. Morris life was golf, he worked as greenkeeper, club and ballmaker, instructor and course designer plus he played golf. He came second in the first Open in 1860 and then won in 1861, 1862, 1864 and 1867. When he won in 1867 he was 46 years old and that is the oldest winner of the Open Championship and he was part of the only father and son couple being winner and runner-up. 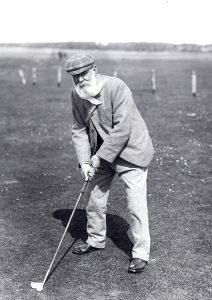 His son Young Tom Morris was an incredible golfer, who won his first Open Championship at the age of 17, the youngest champion in a major championship in golf history. He won the Open Championship in 1868, 1869, 1870 and 1872 (there was no Open in 1871) so he won four straight Opens and no one has repeated this. Young Tom Morris died at the age of 24 just four months after his wife and their newborn had died.